The success stories below are from my clients - those that have worked directly with me as their FASTer Way to Fat Loss® certified coach. Please keep in mind that your results may vary based on where you start and how well you follow the FASTer Way lifestyle. 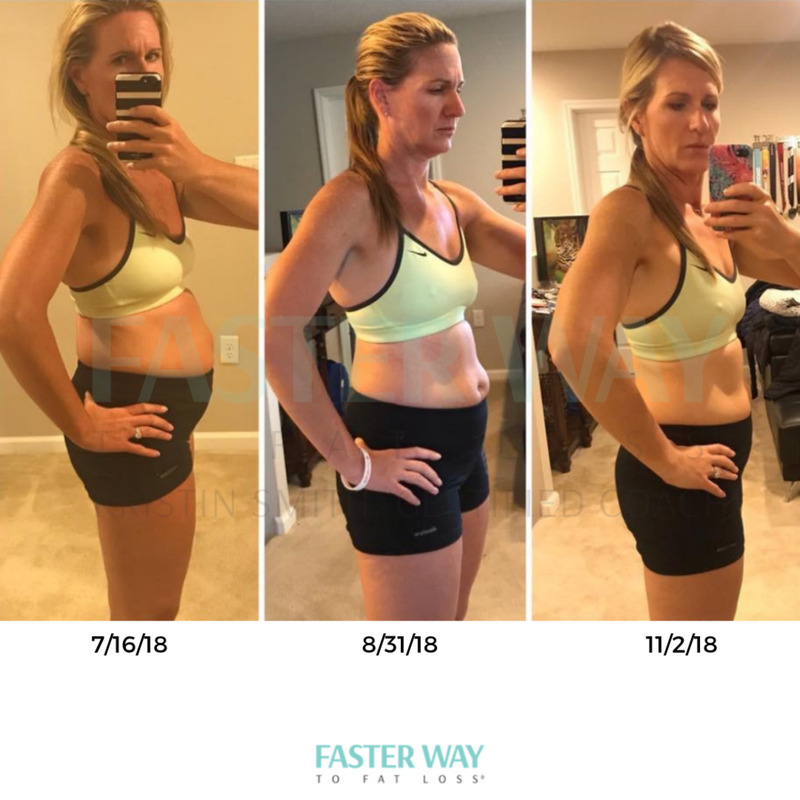 What kind of coach would I be if I didn’t share my own before and after pictures from my time as a FASTer Way to Fat Loss® client?! I had zero desire to try the FASTer Way the first few times I heard of it. I assumed that it was similar to all of the other diets that I tried in the past.. the ones where you lose a few pounds but then as soon as you stop following the super-strict rules, you gain it all back (plus a few extra!). Thankfully, one of my friends was the guinea pig and signed up. After seeing her results — results from a real person, that I know, who also loved to eat.. I decided to give it a try. 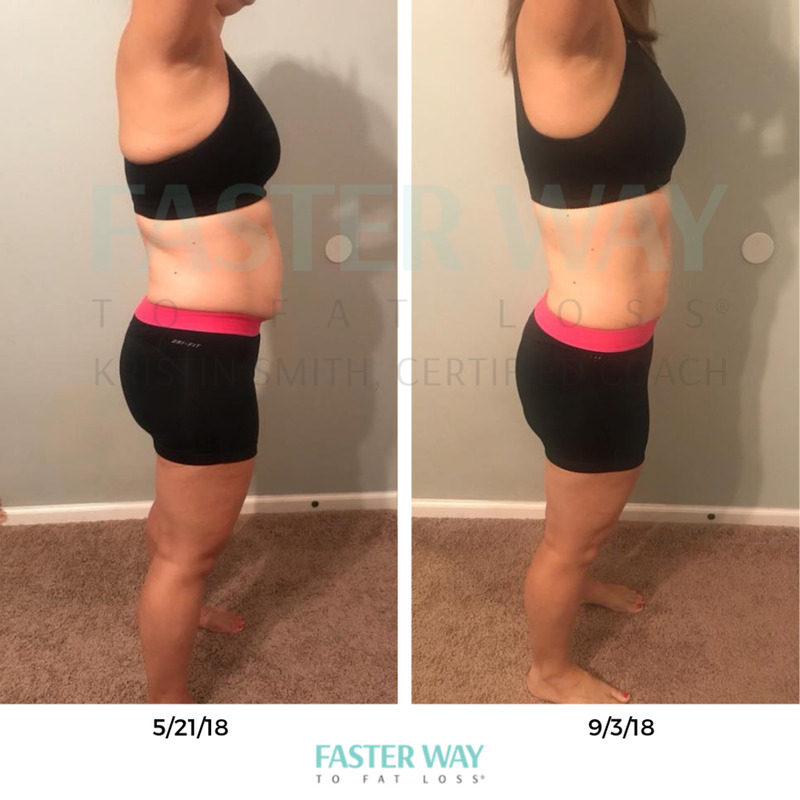 I started the FASTer Way in May of 2018 and I was floored with how quickly I saw results. I was eating more than ever, never feeling deprived, and the fat was melting off. For the first time in a very long time, I was sleeping well and feeling good in my own skin. I went from a size 10 to a 4 and my confidence soared. I was skeptical because the FASTer Way To Fat Loss® sounded complicated. After the first week of eating real food and never feeling deprived, I was hooked. I’ve never felt more empowered or comfortable in my own skin! I am still a work in progress, but I’m turning 47 in four months so I’ll take it! You have no idea how this program fell into my life at the perfect time. My dad is terminally ill and I’m dealing with so much family stress but I’m able to keep going and take care of myself by sticking to this. The FASTer Way is truly one of the best, most realistic programs I’ve done. You eat real food. You learn all about nutrition goals that are good for you (not one size fits all). There’s no guilt what so ever. Workouts are challenging. And you can easily do program while juggling everyday family chaos! I'm a wife, mom of two (7-year-old boy and 4-year-old girl), and medical editor. I have my Master of Public Health and have spent my 11 year career reading thousands of studies about diet, fitness, and chronic disease prevention. What I've learned is diets don't work and "follow a healthy lifestyle" is way too general for most people. Enter the FASTer Way to Fat Loss® . This is the first program I have ever seen that I fully believe in! I am so impressed with the FWTFL. Full disclosure: I haven't been doing the FWTFL prescribed workouts, instead I've been sticking with my routine of Orangetheory (OTF) and running. I cannot believe the difference in how my body feels. I did 6 OTF classes in 8 days, something I never would have been able to do before because I'd be so sore and achy. Just by fueling properly -- I've always eaten healthy but had NO idea I was under eating and eating way too few carbs -- my body is recovering faster and I feel strong.